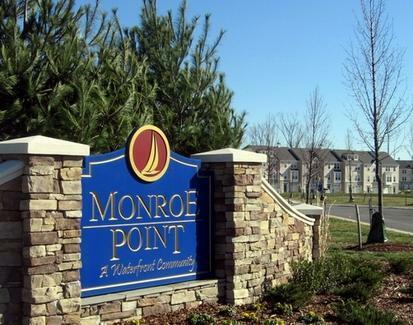 Monroe Point is a beautiful waterfront townhome community across from the Beachgate Shopping Center on Route 205. Featuring floorplans with numerous different options and configurations, ranging in size up to 2,560 square feet, J.L. Builders' and Ryan townhomes are quite nice and offer great views of picturesque Monroe Bay and the surrounding area. 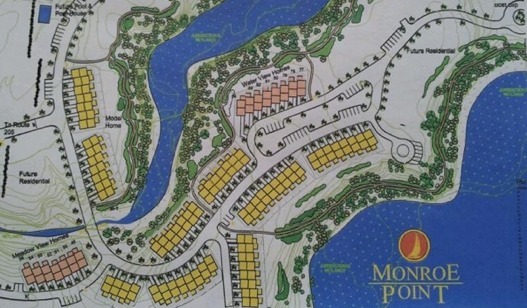 The way the community is situated, most of the units have water views, and all of them may once a proposed large pond is installed on the premises. These one-car garage, tri-level, three-bedroom and three bath luxury townhomes are exquisite. The most popular floorplan is the Bay View model. A couple of the models have first-floor living, for those who are not fond of stairs. The community is in an excellent location, with easy access to the town of Colonial Beach, and a grocery store and other shops right across Route 205. President James Monroe was born within just a very short distance of the townhome community and that is how the area got its name. Residents can take a leisurely stroll on the one-mile long nature trail that winds around the water's edge. I walked it once and it is quite enjoyable, with wonderful views of Monroe Bay and across the water to Colonial Beach. I noticed the community is set in a very tranquil location on the waters edge and it's a nice and peaceful area. There is also a marina with over 50 open boat slips for residents. Future phases of the community are slated to include restaurants, shops and services, a pool, tennis courts and even a clubhouse too. The community is in Phase 2 of development, with more units slated to be added near the water.